While hummus has been a staple in Middle Eastern cuisine for centuries, its rise in popularity in the U.S. is striking, occupying 34% of global hummus consumption, and its popularity continues to rise. It was named “Dish of the Year” by Bon Appetit Magazine in 2015, and is projected to exceed $1 billion in global sales by 2022. Hummus also fits well with the current consumer snacking trends. 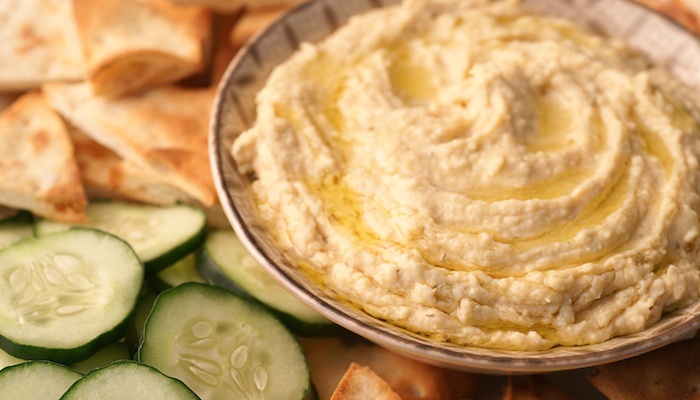 Many food manufacturers have added hummus to their product lines to meet these demands and offer the many benefits of this product to their customers. Vitamins and minerals — Includes potassium, phosphorous, magnesium, calcium, iron and zinc; and vitamins A, B1, B2, B3, B6 and folate. With so many benefits, it’s hard to imagine improvements. But there are product challenges that some food manufacturers face, including reducing fat and calories, incorporating current trends, and improving flavor. These challenges can be overcome by reformulating with Greek yogurt or dried Greek yogurt powder, such as Grande PrimoTM G60. The health benefits are numerous, but a typical serving of about four tablespoons of traditional hummus contains 100 calories and nearly 6 grams of fat. Using Greek yogurt in your formulation can cut fat in half and calories by almost a third, without bumping down the tahini or oil. To further improve nutrition, including Greek yogurt or dried Greek yogurt powder in your formulation also increases protein content. The popularity of Greek yogurt continues to soar and incorporating dried Greek yogurt powder into your hummus formulation enables you to align your product with this trend. It allows you to add the Greek yogurt flavor consumers can’t get enough of, and include Greek yogurt on product packaging. Plus, because it’s a natural ingredient, dried Greek yogurt powder can also help to keep a clean product label. Using dried Greek yogurt powder in your hummus formulation can help you improve an already popular food product. Our team of expert food scientists are eager to help you make these improvements and ultimately help your company reap more market share by touting the added benefits. Reach out to us today. Discover more creative ways to use dried Greek yogurt powder in our eBook, Using Dried Greek Yogurt Powder: A Guide for Food and Beverage Applications. Click the button below for your free copy.